The Young Women (ages 12-18) in our church are encouraged to participate in the Personal Progress program. There are 8 Young Women's Values, symbolized with 8 different colors. 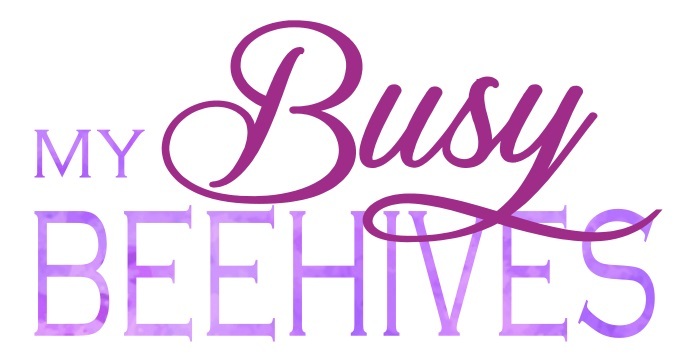 Every girl works on various goals and projects throughout the year, under the 8 different themes. Each goal brings them closer to an understanding of who they are as a child of God, and what their relationship is to the Lord. One of their ongoing projects is to read their scriptures every day, and to read the entire Book of Mormon, cover to cover. 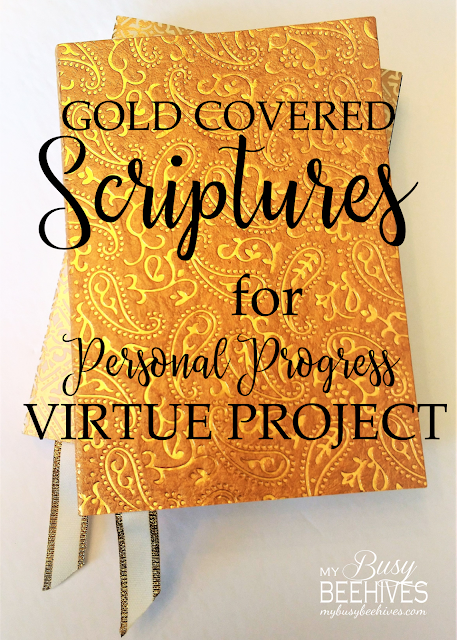 This is part of the Virtue Project, which is symbolized with the color gold. A sweet friend of mine is currently a leader in the Young Women's organization in her area and asked me if I could help her. 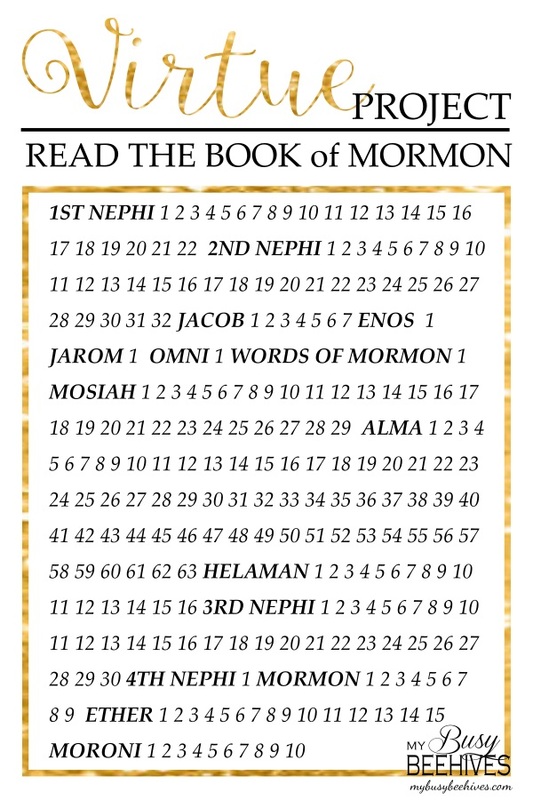 This summer, as a class, they are working towards their goal of reading the entire Book of Mormon. She asked if I could figure out a way to cover a Book of Mormon for each girl in gold. (Because the reading the Book of Mormon is a project under the Virtue theme, which is gold.) I gladly accepted her challenge! I started with some basic supplies. 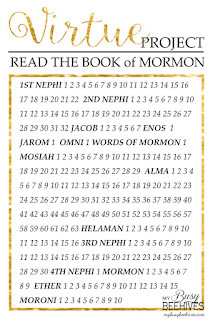 I was able to buy the inexpensive paperback copies of the Book of Mormon. I also found some gold foil patterned scrapbook paper and some gold trimmed ribbon. I also used some heavy spray adhesive, which is not pictured here. Carefully measure your books and then cut your paper to fit. Also, cut the ribbon to an appropriate length. TIP: I used a lighter to slightly burn and seal the edge, so the ribbon wouldn't fray. First, I recommend gluing your ribbon to the back flap of the book before you adhere the cover. If your ribbon is thinner, you can also glue it to the spine, but wider ribbon will lay flatter if it is adhered to the back. A. Very carefully line up your book and your cover. Spray one side of the book and paper, join together and smooth out. B. Flip book over and repeat the process. C. Make sure to get glue all the way to the edges, to avoid peeling. E. Dry thoroughly before use. 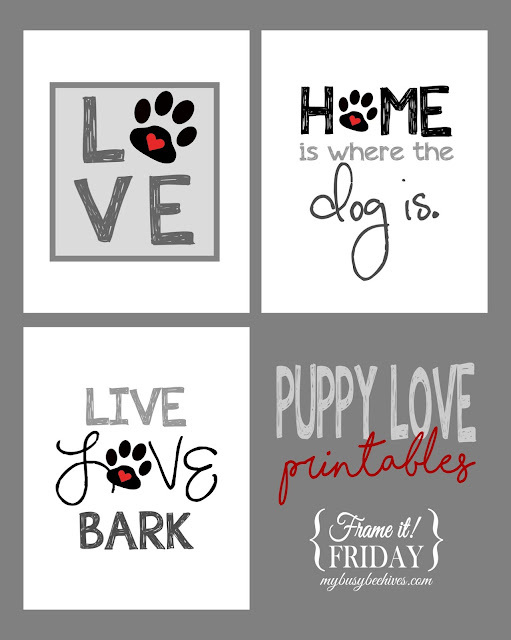 Don't forget to print off your reading chart! Very nice! My youngest is a Laurel and this is a great idea, Julie.